Aelita is a classically trained Feng Shui practitioner. Since 1989, she has studied and worked with internationally recognized masters in architecture, design, the mantic arts and Feng Shui. Aelita has built a firm that attracts private clients, public organizations and businesses seeking advice on how to enhance their spaces, achieve harmony, and enjoy success. Having completed over 1000 consultations in Europe & the US, she is a leader in her field. 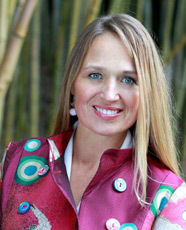 Since receiving her professional certification, Aelita has applied her knowledge through mentoring and teaching the next generation of Feng Shui Consultants at Golden Gate Feng Shui School. Annually, she spends extensive time in Asia working along side of renowned masters and deepening her study of the mantic arts and feng shui.